Top Republicans Back House Rep For Attorney General - Joe.My.God. 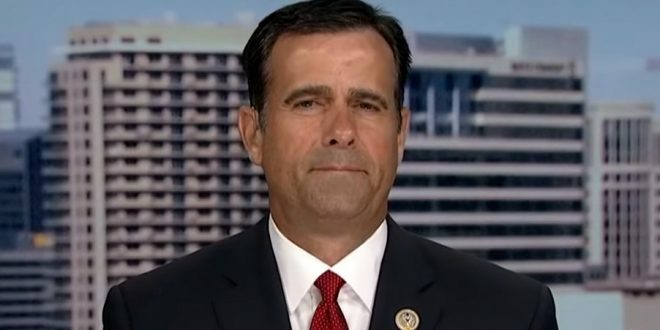 House Majority Leader Kevin McCarthy (Calif.) and other top Republicans are calling on President Trump to name Rep. John Ratcliffe (R-Texas) as the next attorney general. “Look, it’s the president’s choice but one thing I know is John Ratcliffe probably has the best abilities to do the job and most knowledge to do the job,” McCarthy told The Hill on Friday. “He is a very bright lawyer. He’s been a U.S. attorney. He’s done federal prosecution. He knows the law as well as anybody,” said Rep. Mike Johnson (R-La. ), who was elected on Friday to chair the Republican Study Committee (RSC), the largest conservative caucus in Congress. Rep. Matt Gaetz (R-Fla.), a House Judiciary member, told The Hill that he has advocated for Ratcliffe to be the AG during one-on-one conversations he has had with the president. McCarthy and Gaetz are among the president’s closest allies on Capitol Hill and speak with him regularly. The former mayor of a small Texas town and elected to the House in 2014 when he primaried 17-term GOP incumbent Ralph Hall from the right, Ratcliffe has been especially visible on Fox News in recent weeks to rant about the migrant caravan, the Mueller probe, and the usual right wing fever swamp topics. The Heritage Foundation ranks Ratcliffe as the most conservative Texas legislator in Congress. In 2015 he denounced the Supreme Court’s Obergefell ruling because “my faith is very important to me.” He’s not a member of the far-right House Freedom Caucus, which likely plays into McCarthy’s endorsement.